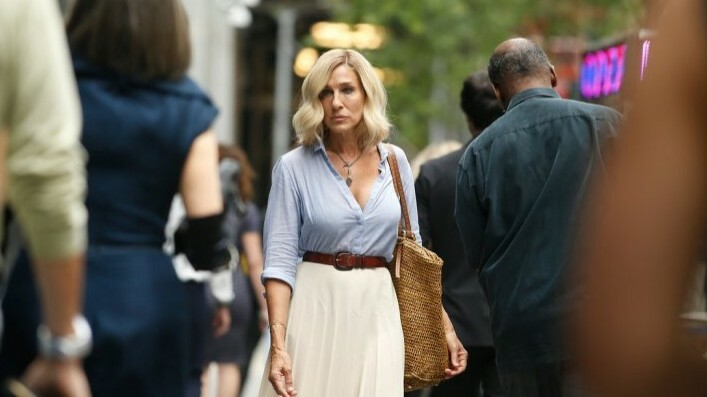 HERE AND NOW has Sarah Jessica Parker like you’ve never seen before. Who says straight-to-Home Entertainment releases have to be a cut below? The Fashion icon delivers some of her best work yet in a subdued and meditative performance which soon won’t be forgotten. The Drama which premiered at the Tribeca Film Festival, is by Director Fabien Constant. It centers on Vivienne (Parker), a successful singer based in New York who one day receives some unsettling news about her health which has her realigning her priorities and what really matters in her life. The story unfolds the night before she goes into the hospital for a procedure which could debilitate her, including her ability as a musician. Her relationships are tense and passionate with mother (Jacqueline Bisset), ex-husband Nick (Simon Baker) and daughter Lucie (Gus Birney). This recent bit of news has her re-evaluating where she stands with them. She has an intense love affair with drummer Jordan (Taylor Kinney) and we get a glimpse of her happier past when she crosses paths with an old friend in Tessa (played enchantingly by Oscar winner Renee Zellweger). Parker winds Vivienne tight, concealing her pain and worry within and we feel her deep torment as she must face the inevitable in very little time. She has little to say, but the emotional undercurrent runs deep and like the jazz songs Vivienne sings, Constant paints an elegant canvass of moody blue. The Film is divisive if you’re not willing to commit all the way to where it goes at its cool pace, but we were enamoured by Parker‘s performance and are glad we stayed the course. Paramount Home Media Distribution release HERE AND NOW on DVD Tuesday, January 22, 2019.